The ultimate 28 day essential tour. Visit and experience the very best of New Zealand. From the top of the North Island to the deep south enjoy superb hospitality while staying in a fantastic range of hotels, luxury lodges and boutique accommodations. Day 3 - Collect your rental car then head North to Waipoua Forest. This evening enjoy a twilight tour. Heading east from the Hokianga, a detour to Rawene is recommended (signposted) to view the historic wooden buildings on the harbour and stop for a break at the Boatshed Cafe, sitting on the water with fantastic views, the nearby boardwalk through the Mangroves is also interesting. Crossing from the west coast to the east you pass through the township of Kawakawa, home to the remarkable Hundertwasser public toilets, designed by the Austrian artist Friedensreich Hundertwasser. 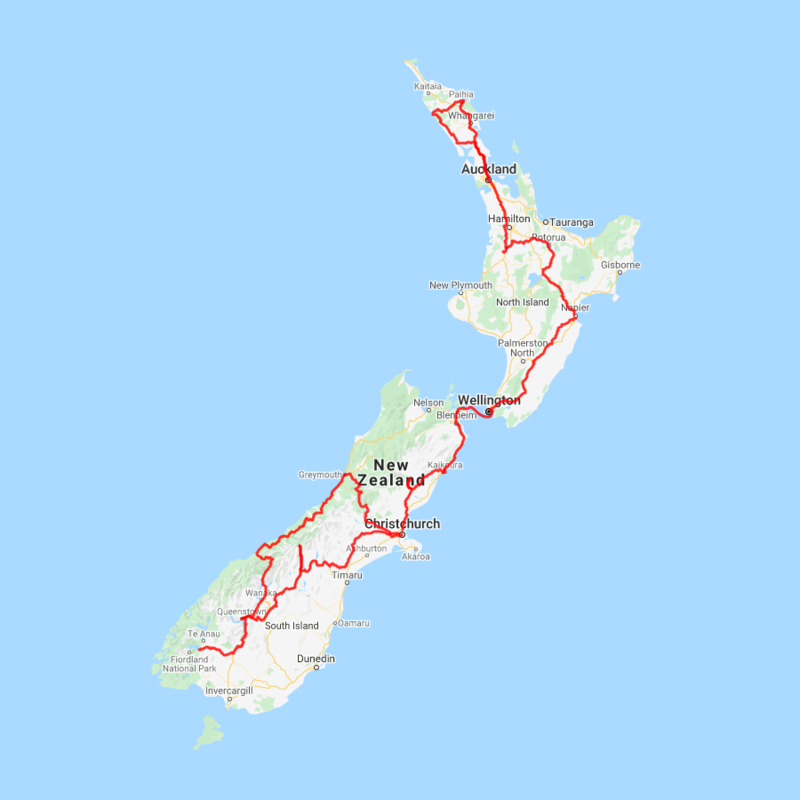 Kawakawa is also known as the ‘Train Town’ as the train tracks run through the centre of town with the vintage trains running every Friday, Saturday and Sunday through the middle of town. Continue east to Opua where you’ll board the car ferry to Russell. The historic village of Russell sits on the waterfront and is the launching point for many marine encounters, swim with the dolphins, kayak or cruise the beautiful Bay of Islands - there are many ways to experience this paradise. Today leave the Bay of Islands behind as you head south towards Auckland, City of Sails. You'll go through Kawakawa, famous for its unique Hundertwasser toilets, before passing the port-side town of Whangarei. Continue on through Warkworth and take a side trip to Matakana, renowned for its beaches and boutique vineyards. As you near the outskirts of Auckland, stop for a breather in Puhoi, New Zealand's only Bohemian settlement, before passing through the North Shore and into the heart of Auckland City. Leaving Auckland you'll journey through the Bombay Hills and into the rich dairy pastures of the Waikato. Marvel at the limestone hills of the Waitomo countryside before arriving in Waitomo itself, home to a huge underground network of caves. Picton is a picturesque portside town at the top of the South Island. Gateway to the forest, marine and island attractions of the Marlborough Sounds, Picton is built around a sheltered harbour. Home to cafes, restaurants and galleries it also has a floating maritime museum and aquarium. Picton is also the starting point to Queen Charlotte Track, one of New Zealand’s leading hiking trails. The drive from Kaikoura follows the spectacular coast before heading inland through North Canterbury’s major wine region, The Waipara Valley. You’ll see many sheep as you wind your way through the vineyards and small towns of Rotherham and Waiau before arriving into the alpine village of Hanmer Springs, your destination for the night. Today you’ll travel through the Waipara Valley, the fastest wine growing region in New Zealand and across the Canterbury Plains to Christchurch. You’ll pass vast grassy plains and parched farming landscapes as you make your way over the Weka Pass and past small towns such as Amberley and Leithfield before arriving into the largest Port in the South Island, Christchurch. On this flight you'll have the chance to experience some of the most breathtaking scenery in New Zealand. View Mount Cook, Westland, Mt Tasman as well as the Fox, Franz Josef and Tasman Glaciers. First traverse the southern alps to the West Coast then Track North along the Tasman Sea before re-crossing the alps to the Tasman Glacier. If the weather conditions are right, you'll also experience a glacier landing before taking a final loop through the mountains.